If you are a regular reader of ShineMat then you should see we have published some posts about Affiliate Marketing. Today I am going to unveil the top 10+ affiliate marketing tips. In short by definition, Affiliate marketing is a great way to earn commissions by selling products or services which is created by someone else or company. 1. Always sell only good quality products or services. Selling bad things to earn quick money will give you a limited time affiliate career. Don't do that. Here honesty matters. 2. Selling a product of little value is a great starting idea but you must consider and think deeply in some terms of selling the high valued products or services to the same affiliate customers of yours. Sticking with low priced products or services will make you creating a massive income which is very difficult. 3. Never sell a product or service that you don’t even bought or personally used. Just think, if you do not use or have confidence in the product or service why should anyone else? 4. It is very easy to create a sales funnel in general. In other words, the producer or the owner have to be able to deliver at least one further, more costly product or service that you can offer to your customer in future time. 5. If number 4 point is unavailable, then you have to be able to origin other products or services to inspire and market your list. 6. Ensure that the producer or owner has a sales webpage without tacky. It should include proper details, endorsement, images and illustrators and a strong call to the action. 7. The overall affiliate commission should be at least 40% to 50% and preferably greater. 8. Choose and stick with a affiliate niche that you know best and have interest. You will find lots of difficulty to apply it in your work if you choose to promote something that doesn't match and have not enough knowledge to you. 9. For your customers it is reasonable to expect some kind of warranty, guarantee or money back promise. However 1 month or some more times comes with a technical or built in trouble. Within a month I think it should be very easy to possible for everyone to save the main and additional details of any product or service to return the full amount as refund. 10. 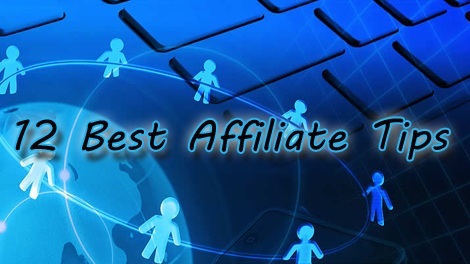 You have to access to the essential affiliate tools. Like as: rich graphical banners, e-mails followup, video promotion and the different sales websites. 11. Always create your consumer email list. Analyze and add people to your business mailing list by using an auto response mail service which will help you to make a good and long term business relationship and not just only a simple one hit wonder. 12. The producer/ owner of the product is responsible for provision the product and customer care service. So it is a extremely necessary matter for you to communicate and take care with your customer list regularly. I would recommend you for doing this at least 4 - 5 times within 30 days. Well! I found these affiliate marketing tips that really works well. If ShineMat’s affiliate marketing tips help you little bit we will be very glad. Kindly spread our voice with your friends. To share simply use sharing buttons at below. Best of luck buddies! Have a nice day.